Make an appointment by calling 541-754-1254. Current patients may also click here to request an appointment through our Patient Portal, or create an account. New patients, click here to have a representative call you to set up an appointment. 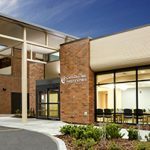 At The Corvallis Clinic Surgery Center, we know you have a choice of where to receive your medical services. Thank you for allowing us to care for you. We are located at 601 NW Elks Dr. The Surgery Center is the first building on the right when you turn from Elks Dr to the main clinic parking lot. If you have questions regarding our center please feel free to call us at (541) 754-1254. Your doctor’s office will schedule your procedure. Once scheduled, a member of our staff may call you to obtain further information. Our front office will also contact your insurance company to get your benefit information. This information will be used to calculate an estimate for your patient responsibility which will be collected when you check in for your procedure. We will notify you of your estimate once it has been calculated. If you do not receive a call and have questions, you may contact our front office at (541) 754-1254. If you develop a fever or cold the day before your procedure, contact your doctor at once, as your procedure may need to be rescheduled. Remember, DO NOT EAT, DRINK OR CHEW anything after midnight the night before your surgery, unless otherwise instructed. This includes gum, mints, candy and chewing tobacco. • Do not eat or drink anything the morning of surgery, unless your doctor has given you other instructions. • Take your medications, as prescribed by your provider, with a sip of water; unless otherwise instructed by a member of your healthcare team. Diabetic patients, ask your physician how to adjust your dose of insulin on the day of your procedure. • You may brush your teeth and rinse your mouth with water. • Wear clean, loose, comfortable clothing. Leave all valuables and jewelry at home. If you wear glasses or contacts, bring a case to store them in during your procedure. Please do not wear makeup, perfume or nail polish. • You should have a driver over the age of 18 on the day of your procedure. If your driver is unable to remain in the facility while you are in surgery then we will need a contact phone number in case we would need to reach them. • Health History form (which you have filled out at home). Next, you will be taken to the pre-procedure area where a nurse will verify medical information, allergies, and your current medications. The nurse will prepare you for the procedure and the anesthesia provider will meet with you to discuss your medical history and the type of anesthesia you will have. You can expect to spend approximately 30-90 minutes in the post-anesthesia care unit, depending on the type of anesthesia you have received. The nurses in this area will provide you with some instructions for taking care of yourself at home. Should problems or questions come up when you are home recovering, call your surgeon at the number provided on the discharge instruction sheet. One of our nurses will call you the day after your procedure (or Monday after a Friday procedure) to ask a few questions and address any concerns that you may have at that time. We have provided a patient satisfaction survey attached to your instruction sheet. Please take a few minutes to fill this out and return in the pre-paid envelop. Thank you for your time and the part that you have taken to make this a positive experience!